Easily add lightly-grooved patterned icing to your cakes, cupcakes, pies, and more with this Ateco 828 5/8" open star #19 pastry tube. Made of durable stainless steel, this tube is rust-resistant and designed to withstand repeated use without bending out of shape. Featuring an open star tip, you can create shells, stars, fleur-de-lis, rosettes, and flowers. The open star design produces a subtle texture great for a soft presentation. Plus, its large size is perfect for icing confectionary creations quickly and efficiently. Using the right sized pastry tube for the job will enhance your presentation to draw patrons' attention to your display cases and plated desserts. It feels very sturdy, so I don't have to worry about the ends becoming bent. Great multipurpose tip. Such a great and easy tip to use. Ateco makes nice sturdy tips! Definitely recommend to any baker! Ateco is a great brand for decorating tips! We use this to top our cupcakes and we love the result. We would definitely recommend these to anyone in need of decorating tips! Love this icing tip! This is a jumbo sized tip that is perfect for the classic cupcake swirl look. Be careful cleaning it because it is sharp! Whether it's a simple low swirl, drop stars, or double swirls for a taller cupcake, this is one of the best and most versatile piping tips for frosting cupcakes. I like for my frosting to have a little more definition so I do like to bend the straight tips inward a tiny bit. And of course this is the same high quality as other Ateco piping tips. The open star tips are also a bit easier to clean so that's a plus, too. This is the tip that we use the most in our establishment. We use it for cake decorating, for decorating our pancakes and waffles and even to pipe our eclair shells. These tips are the perfect size and are very durable. Such a great tip! This Ateco 828 5/8" Open Star #19 Piping Tip (August Thomsen) is very good quality, price and does an amazing job. My cakes and cupcakes look very pretty and finished...I will buy again. Love this tip for piping cookies or pastry or cupcakes! Large and sharp edges for a professional loom that customers really love. I will be ordering more! This rather larger open star tube is ideal for larger cakes. If you decorate a number of different cakes, you will like having this as an option. We love this French star tune. Easy to clean and easy to use. Great for using on cakes and cupcakes. Fits in most bags we use. This is a nice wide tip, we use it often for cupcakes and cookie sandwiches. We just wish webstuarant would stop wrapping the shipping labels on tips since it's so hard to remove the goo from them! I use to purchase cupcakes from the store until I tried the Ateco tubes. They are so easy to use and clean. I will never go back to buying cupcakes again. Thanks Webstaurant Store! The Ateco 828 has the open star shape design. This is a very classic shape for pastry tubes. This tip measure 5/8" wide. We own this shape in many tip widths. The price of Ateco pastry tubes is very reasonable here on the site. We do suggest having multiple sizes and styles on hand for your pastry team. I like to use these on the base of a cake and then work my way up to a smaller tip. Large tip is easier to clean too. I love this Ateco tip my cupcakes look so professional and visually appealing. The big size allows for a good amount of frosting distribution on my cakes and cupcakes. This product is a great addition to use in icing and decorating cake. Since the size is large enough, I also use this tip for piping Éclair dough. The extra large Ateco tubes are my favorite to use when decorating cupcakes. They are exactly what you need to get that bakery style look..
Ateco 828 5/8" Open Star #8 Pastry Tube (August Thomsen) is a Large star that cuts down your decorating time without sacrificing precise detail to make what you need to. These pastry tubes will not disappoint!! We just ordered a batch for decorating our cupcakes and cakes at our events and they work great for styling with the larger opening. Great product. My only concern is that the tip is fragile on the end. When I received it it was bent in but I was able to move back into place. I think that is just a limitation on the design. Great large Ateco star tip. We use this tip to make large star decorations and large peak mountains on top of cupcakes. Great quality for great value. The Ateco 828 5/8" Open Star #8 Pastry Tube (August Thomsen) is one of my favorites. Being large, it doesn't take long to decorate which is definitely a plus. The quality is excellent and the price is very reasonable. I highly recommend this pastry tube. This pastry tube is useful to decorate and homemade or commercial cakes or cupcakes. It could be used with the disposable pastry bags or regular pastry bag. It's funny, I thought I wasn't good at icing cupcakes until I started using these larger sized tubes. Now every attempt comes out looking great. This tip also makes icing look like soft serve ice cream swirls. This is a wonderful pastry tube. Great for large decorating areas on those special cakes! This open star#8 is fairly large so it covers an area quickly with control. The icing comes out of tube nice and smoothly! I use this tip for standard sized cupcakes normally. However it works well on tortes and cakes on the top piped in a circular motion. They work great and fit with a medium sized coupler. Ateco makes great tips, and this Open Star is no exception. This tip is perfect for quickly frosting cupcakes. The stainless steel tip is durable and cleans up easily in the dishwasher. This icing tip makes a great addition to my collection. Great for many uses on cakes, cupcakes and also for putting icing in the center of sandwich cookies. This is a large open star pastry tip perfect for piping along many desserts and also for piping roses. It is very durable and cleans very easily. I'm a cake decorator and own many Ateco cake tips. They are very durable that will last a long time. 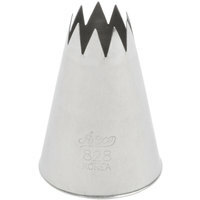 Tip 828 is a larger tip that we use this to pipe icing on cupcakes. This is a pretty big open star pastry tip. I like it for piping various whipped toppings on baked desserts, fresh berries, or even hot chocolate. Works perfectly with the Ateco pastry bag and coupler. This tip is perfect for the piped roses on my cakes. Its durable and cleans up well, and is perfect for my cake and cupcake needs. I love these things! They give such a nice, professional look to homemade cupcakes with just a couple of minutes' extra time, and if you get the disposable pastry bags there's no mess to clean up afterwards. I've started a collection of pastry tubes in different sizes and shapes, and I see the newest ones on the market are Russian pastry tubes which come in unusual designs not seen in the American ones. Here's hoping Webstaurant store starts to carry them too! We use this tip for some of our character cupcakes to add texture to them. The open star makes it easy to quickly dab frosting on our cupcakes. It's yet another great Ateco tube/tip. This one has a large opening. It's great for piping, larger swirls, fillings, and more. It uses the larger size coupler. I use this for piping my Italian sandwich cookies. They come out beautifully every time, and are large enough to handle a heavy cookie dough. Nice tip for large dollops and really fat pipes. Good metal construction, solid and clean when piping. Get a coupler to make your life easier when changing tips! These Ateco tips are tried and true. The are not easily bent or smashed. They hold their shape even when thrown into a commercial sink and get beat around. The icing comes out smooth and perfect every time. Great for icing cupcakes! As with all Ateco pastry tubes, the quality of this product is excellent. I love using this extra large tube for piping frosting onto cupcakes. These are great. They last for a long time and create a perfect frosting look. They can be a bear to clean on one end, but you will get the hang of it. The price is great too. Ateco does it again! This # 8 open star tip is a quality piece for larger frosting jobs. It is constructed well and priced to sell! Love this large frosting tip. Makes frosting cupcakes faster and easier because of its size. The bold size definitely stands out and my cupcakes look great. Ateco pastry tip are a good choice. There are other companies but these are a good product and choice. These will hold up very well. Great to use with the canvas pastry bag for mashed potatoes. We also use this tip for our homemade whipped cream decorations. Best part is they don't rust! This large tip works perfectly for cupcakes, you get that professional, bakery look with literally no effort. Side note: must have tip of you make or ever will make meringue cookies, gives them that nice classic ribbed look. I ordered this tip by accident but it has easily become one of my favorite tips to use for frosting cupcakes! It creates a beautiful, swirled design on my cupcakes. Perfect size for a beautiful rose on cupcakes! Ive tried other sizes and this one gives you the perfect tube. Also, as far as quality goes, Ateco...in my opinion...is of much better quality than even Wilton. The steel seems to be slightly thicker and amazingly smoother. This is a really large open star tip that works great for a large decor. We love how clean our frosting pipes out of these tips. Great Value! The Ateco Star pastry tube is a wonderful tip for cake decorating, nice and sturdy doesn't get clogged and easy to clean. Makes decorating cakes a joy. I bought the 8" pastry tube and have used it in a large 16" piping bag, then I added three small bags size 12" inside with different color frosting to swirl onto cupcakes to show off the three colors for the 4th of July. This is a BIG, sturdy tip. I wouldn't really recommend this for a standard cupcake use, the 1/4 size is better. This tip works well with jumbo cupcakes or if you plan on piping cakes. This Ateco #8 Open star pastry tube makes beautiful star shapes. It pipes easily with both royal and buttercream icings. This brand is reliable and sturdy. It also is a good price. We use this pastry tip to pipe beautiful swirls of frosting on our cupcakes. They have held up after years of service and are very easy to clean. this august thomsen open star is a wonderful addition to my cake decorating supplies! I am a novice, having just completed a cake decorating course. the star tip is my favorite! This #8 Open Star Tip is HUGE. If you're looking to frost a Cupcake, This may be too big. Perfect for filling Cannoli's. Stainless steel, made of quality steel, so you do not have to worry about the tips bending. Best price on pastry bag tips ever! Worried they might get lost in shipping since they are so small but they were packed so they could be easily spotted. After using a smaller star tip for cupcakes, I was looking for an option to speed up the frosting process while maintaining an elegant look. This larger tip makes piping easier and provides beautiful detail. I love experimenting with different tips for my cupcakes. This one is not to big, and definitely not too small. Gives a great touch to any regular sized cupcake. I frost a LOT of cupcakes so I have multiple star tips to make the job fast and easy. I've had these tips for about 2 years and the quality if superb. Used this large star tip to ice my s’mores cupcakes worked great and made for a beautiful presentation after torching the marshmallow frosting. These larger sized tips are hard to find locally but with these great prices I would just continue to order them here. Very affordable Pastry tube made by Ateco. Easy to clean and fits standard pastry bags. Great for making a nice swirl on top of a cupcake. This pastry tube and the 827 tube are my absolute favorites to frost standard size cupcakes with, as they create swirled frosting with ridges that's proportional to the size of the cupcake. Very good tip for professional looking cupcakes. This is a tip that I have not been able to find in any local craft or food related stores. Allows for crushed oreos to be put in the frosting and comes out through the tip with no problems getting stuck. Awesome products! Works well with the pastry bags bought here as well. We don't use it for desserts but to add the finished look to some of our dishes. I love using the open star pastry tube. I think i have every size too. It creates such a pretty design and the price is awesome. Best decorating tip for large rosettes, I use this tip on almost all of my baked goods. Looks beautiful. Very well made at a great price. I was looking for a frosting tip that would be durable, cost effective and easy to clean. These frosting tips were exactly that. I've since ordered 10 more as extra surplus in my bakery- they work great!